In 2012, Sergio Guerrero Sánchez arrived at Sabah, Malaysia, invited by Benoit Goossens to assist as Veterinarian for the Sun bear (Helarctus malayus) project for three months. After that period they agreed terms of a longer stay at DGFC working as wildlife vet and to boost his personal and professional experience. 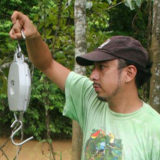 Sergio, thus, became the Wildlife Veterinarian Officer based at DGFC where he’s involved in most of the projects that need a veterinarian for anesthesia, sampling or welfare supervision, especially the Small Carnivores Project, the Kinabatangan Clouded Leopard Project, and the MONKEYBAR Project. He’s in charge of post mortems and of the rescue of injured animals found within the DGFC’s influence area. In April 2013 he started the Biawak (monitor lizard) project, which in 2014 became his PhD research project at Cardiff University. Sergio is a veterinarian graduated from the Universidad Veracruzana (Veracruz, Mexico, 1998) and a Master in Science in Natural Resources and Rural development by El Colegio de la Frontera Sur (Campeche, Mexico, 2011). His experience on in situ and ex situ wildlife management and conservation started while working at the Zoológico Miguel Álvares del Toro (ZooMAT) at Chiapas, Mexico, focusing on conservation of neo-tropical wildlife. Sergio’s work focuses on disease ecology, wildlife populations’ health and conservation medicine with an emphasis on human-wildlife interphase effects. He has collaborated with and attended national and international training workshops on exotic disease surveillance, control and eradication. Sergio has also worked on three projects focusing on zoonotic and anthropogenic diseases in buffer areas of Natural Reserves located in Chiapas and Campeche, Mexico. Aware of the importance of human activities as factors in biodiversity conservation and how social and environmental welfare are linked, h performed some work in ethno-veterinarian issues, focusing in the traditional knowledge system on domestic animals health and welfare. Sergio worked as an external collaborator of an interdisciplinary project on the enrichment of rural home gardens and poultry health, to be incorporated in the management and conservation of the Grijalva River’s Basin in Tabasco and Chiapas, southern Mexico. Born in Mexico City and raised under the traditional Mexican family principles, his path has been influenced by several people (all friends) and circumstances throughout more than 30 years. Sergio’s life has been driven by service and empathy, always trying to change the impossible into just difficult and work and live with passion and wisdom. Member of the tapir (Tapirus bairdii) and white-lippped peccary (Tayassu pecari) National Advisory Board (acknowledged by the National Commission of Protected Natural Areas, Mexican Government). Advisor or wildlife conservation and social affairs for sustainable timber enterprises (Mexico).